For-profit companies simply must make sales to stay alive. Without trivializing the difficulty of reaching new customers while maintaining current clientele, it really is that simple. But where do we go, and what methods should we use to reach new customers? Magazine ads? Radio spots? Television commercials? Billboards? Online ads? All of the above? It depends, of course, on where your customers are, how they’re accessing new information, and where they are spending their time. According to Smart Insight’s 2018 Global Social and Media Research Summary, the current number of internet users worldwide is 4.021 billion—up 7 percent from last year. Interestingly, the number of mobile phone users in 2018 far outpaces that number at 5.135 billion—up 4 percent over 2017. 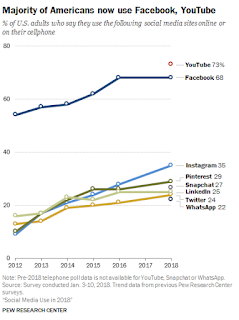 Considering that the current number of social media users worldwide is 3.196 billion—up 13 percent from the previous year—it’s not a stretch to think that if the 1.1 billion mobile phone users who haven’t yet used the internet ever do attempt to access it, they will do so though their phones—and according to this year’s data, 3 out of 4 of those will use social networks as the conduit. If the Internet is the bed upon which we all rest, social networks are arguably the fitted sheet, and the cell phone is the bed frame. Once upon a time, the older generation would confidently claim that social networks are purely for the younger generation. 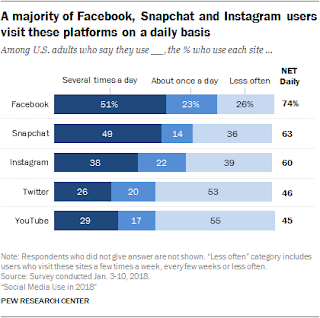 However, they might consider Pew Research Center’s findings for social media use in 2018, wherein “…roughly two-thirds of U.S. adults (68%) now report that they are Facebook users, and roughly three-quarters of those users access Facebook on a daily basis. With the exception of those 65 and older, a majority of Americans across a wide range of demographic groups now use Facebook.” Excepting retirees, most adults are engaging on Facebook—right now. Gary Vaynerchuck—or GaryVee as he is known on social—loves challenging old-school marketing techniques, typically launching a full scale attack (complete with a festoon of F-bombs) against businesses that fail to embrace social media. In a recent article called “How To Sell”, Gary lists several reasons why businesses fail to grow, and a favorite among them is the following cautionary tale: “Being tied down by the idealistic vision of how you made your money in the past. The world is changing! And the way you were successful yesterday definitely won’t be the way you are successful today. You need to look forward and become utterly unromantic about what you did in the past that got you “here.” Read the rest of the article and you’ll find that he’s listed virtually all the most popular social networks as viable channels through which business might reach insurmountable numbers of new customers. But are we ready for that challenge? , you can restrict the amount of bandwidth used by each guest which, in turn, helps all guests enjoy a better overall Internet experience. This way, you prevent single users from hogging up all the bandwidth and causing bottlenecks for everyone else. to restrict the number of devices per customer that can access the Internet at once. Similar to bandwidth control, this feature allows you to prevent individuals from soaking up too much capacity by putting a cap on the number of devices he or she can use to access your network. by filtering all your WI-FI traffic through a continually-updated master index of blacklisted websites. Not only will it help provide a safe surfing environment for your guests, it will also save you money by reducing the likelihood of your receiving copyright infringement letters from your ISP which could quickly generate legal fees if left unchecked. allows you to disable Internet access for guests who are late with their payments. It's a slightly less aggressive tactic that encourages guests to pay their rent in a timely manner or risk losing access to their favorite sites while on your property. will also block WI-FI access for individuals who have been placed on your DNR list. Not only does it deter would-be "piggybackers" (users who log onto wireless services without the owners' explicit permission or knowledge), it also blacklists users who have been deemed unfit for tenancy at your hotel. includes an Intrusion Detect System (IDS) which blocks unwanted malware and prevents infected computers from spreading their viruses to other computers on your network—including the front desk terminal. Uptime is of utmost importance to your business, and you can't afford not to continuously guard against any intrusions. Cash registers have always had a couple of "achilles heels" when it came to theft, namely the no sale method and the void method, and dishonest clerks exploit these functions for their own monetary gain, particularly when cash is used. In the first example, the clerk takes advantage of the no sale option by pretending to ring up the customer, accepting money, hitting 'no sale' (or equivalent command), and quietly pocketing the cash. Not only is this method the simplest, it is also the most devious since there’s no record of a legitimate transaction to examine—only a time-stamped "open register" command. In the second example, the clerk abuses the void function by legitimately completing a sale, and after the customer leaves, the sale is promptly voided and the cash pocketed. Neither heist is perfect since properly-counted inventory will always indicate a loss in revenue when compared to register totals, but shrewd thieves will usually choose items that aren't counted daily (or at all), thus increasing the time between the cash/inventory discrepancy and its discovery. This, of course, makes it all the more difficult to pinpoint the perpetrator. Typically, monetary gain is the end goal, but in the hotel world it could also be a clerk who wants to give a friend or relative 'freeloader status' in an available room. Either way, it's money out of your pocket. But with a property management system like Gearco, these kinds of illicit moves are caught almost immediately since all voids, refunds, or whatever other income reversals that exist, require the clerk to first log into the system and type a valid reason. All of this information is permanently recorded and is also included in reports that are generated at the end of each day. It's not 100% foolproof, but if it does happen, there's a nice, detailed paper trail leading you directly to the guilty party. It’s entirely possible that you’re reading this on a 15-pound CRT monitor while connected to the Internet via a dial-up modem, but we’re betting that’s not the case. Neither do we suspect that a flip phone dangles from your hip with its monochromatic screen and inconvenient inability to connect to the world wide web. It's also quite doubtful you derive the entirety of your musical listening pleasure from vinyl discs, cassette tapes, and terrestrial radio stations, or all of your movie watching pleasure from local television stations, VHS tapes and DVDs. But all of this certainly could be true, right? These individual products and services worked exceedingly well for decades. “If it ain’t broke, don’t fix it”, right? Except that they did get fixed. Hardware became software. Analog signals became digital signals that got tossed into the cloud. Most of the aforementioned bulky, physical components were combined into a single, lightweight mobile device—your cell phone. We had no idea how broken it actually was until it was fixed, and we couldn't be happier about it now. Let's examine just a few of these recent fixes. Apple capitalized on the Internet to reform our music enjoyment through iTunes and Apple Music. Click the "buy now" button on any music track, and ninety nine cents later you are instantly authorized to permanently download your music selection onto as many as five devices at once, further reducing its cost to less than twenty cents. Or, for less than ten dollars a month, Apple Music let's you stream unlimited music from your device. No more wasting time driving to a record store (not that there are any left). Just search, click, and enjoy. Netflix flipped the movie rental industry on it's back by hosting thousands upon thousands of movies and TV shows in the cloud—all awaiting us to merely hit PLAY on almost any device to watch them in their entirety. No longer must we drive to our nearest Blockbuster; instead, we need only lift a finger to tap the encircled triangle. But what about tangible products that can't be digitized? Enter Amazon.com. Residing solely on the Internet, Amazon completely revolutionized the customer purchase experience by offering to deliver, within 48 hours, virtually anything we could ever want. Food, toiletries, software, furniture—even custom-made fine art—can be found, bought, and received at our doorsteps directly through Amazon's online portal. A web connection is all we need. We don't even have to step outside our homes until the delivery man rings the doorbell. By hoisting their operations off of the ground and into the cloud, these three Herculean companies quickly and effectively satisfied the wants and needs of their customers. Not only did these 'fixes' give us instant access to products we want, but the process of actually receiving and enjoying them requires less hardware. Faster access. No hassle. What more could we possibly want? With Gearco’s cloud-based property management systems, owners and managers experience the exact same technological win. For one thing, you can finally ditch those old, bulky, outdated computer systems, and instead, enjoy a slimline solution that not only frees up more space at your front desks and in your offices, but will host the very latest in cloud-based technology. And we won't force you to pay for upgrades; rather, you'll receive all your software updates for free. And there's nothing for you to install either; we handle it all behind the scenes—out of your way—so you can continue to run your business, uninterrupted. And if you're concerned about having to learn a new platform, fear not. With Gearco's training courses, we'll ensure all your employees are following proper procedures and best practices while you maximize your profits. We'll tailor the learning process to fit your demanding schedule, too: Learn by working one-on-one with members of our support team, onsite at your location, or if it's more convenient, we can walk you through the features of your Gearco property management system online via webinar. Topics include check in and check out, renewals, payments, reservations, reports, closeouts, alert points, room and guest search, account search, transaction or task search, and so much more! Why not give us a test drive today? Our introductory 1st gear platform is free for life and includes basic property management apps with limited support—plenty enough to feel the power of Gearco! Easier isn’t better if it means trading something of intrinsic value for the sake of simplicity. iTunes, for example, created an environment for users to easily log in, audition, and buy any song in Apple’s exhaustive catalog of music, and users can download their newly-purchased audio files to as many as five devices. In terms of ease, Apple trumped the old method of acquiring new music—a process which used to steal a half hour of our time, a half-gallon of gas, and as much as fifteen dollars (for an entire album if the preferred song wasn’t available on 7” or maxi-single CD). Thanks to iTunes, a song may be owned in less than a minute for around a dollar without having to leave the couch. And what about the old-school idea of “making tapes” so as to enjoy that brand new album away from home? Apple simplified that process as well when it gave consumers the ability to propagate their purchased songs across nearly a half dozen devices with a single mouse click. No more Saturday afternoons spent connecting disc player outputs to tape recorder inputs. So why isn’t this new, “easier” method better? Well, if you happen to value owning the highest possible audio quality, or gazing at full resolution album artwork (front and back), or studying j-card liner notes that include photos, lyrics, and the names of all the professionals who helped create each song, or showing off your prized collection of records, tapes, and discs, then you’re out of luck. iTunes’ “ease” satisfies only the want of quick ownership, meanwhile giving up supreme audio fidelity, gorgeous framable artwork, and treasure troves of trivia. Fast food drive-thru is another obvious example of “ease”. How could it not be? You drive up, roll down your window, bark your order at a small billboard, drive another 25 feet, and with any luck you get what you asked for—probably for less money than the sum total of each ingredient purchased from your local farmers market. Perfect! So why isn’t such a convenience better? Nutritional health, for one. Try comparing the calorie counts, saturated fat percentages, sodium levels, sugar contents, and preservatives of a fast food meal to that of the very same meal made at home with ingredients bought from your local grocery store. This segues nicely to point number two: Where exactly did your fast food come from? And how long was it there before it got here? Many fast food products arrive frozen, already prepared, and are merely heated up just prior to serving. Several articles have alleged some rather astonishing (and disgusting) food-processing practices engaged by many of the largest fast food chains, and while these practices may be sanctioned by the FDA, wouldn’t we prefer knowing a bit more about the origin of what we’re putting in our mouths? Once again, the “ease” of fast food only sates those hungering for quickness—forgoing the nutritional benefits of fresh food and the knowledge of the food’s source all the while. We might also consider the law of supply and demand and its effects arising from “ease”. When the usage of a product or service becomes easier, less expertise is required by its users. These new, easier-to-use products and services attract swarms of unskilled individuals—potentially diminishing the value of a product or service that once required a well-paid specialist. Seasoned photographers, for example, now compete with selfie-driven paparazzo who have on their smartphones incredibly high-resolution cameras and plenty of app ware that automatically detects “problems” and clears them up with little effort (or understanding of what’s actually happening) by the user. Easy just gave birth to cheap. The photographer must now defend concepts like excellence and experience to justify his pricing. Same goes for music creation: no longer does one necessarily have to dedicate a lifetime to an instrument, hours of study, and endless practice in order to produce palatable music; instead, all that’s needed is a laptop equipped with a twenty-dollar app, and users can simply browse massive, built-in libraries of someone else’s music, and simply drag and drop these pre-made sound bytes into an audio track (enter the modern "DJ"), and Voila! A completed musical “composition”. Easier? Sure. Better? This author doesn’t think so. At Gearco, our primary objective is to service the needs of the hospitality industry by offering an ever-growing digital athenaeum of valuable property management applications. That’s the perspective from which we hope our customers see us. From the inside, what you’ll find is a software development company endeavoring to balance convenience with effectiveness for our users, and what we’ve discovered is that there is a reciprocal relationship between the simple and the powerful. As simplicity increases, power dwindles—and vice versa. As you might have guessed, we chose power. And to neutralize the complexity of our software, we offer our customers a wide spectrum of training options ranging from online, distance-learning courses to personalized, onsite instruction taught by our product specialists. Thomas Edison said, “Opportunity is missed by most people because it is dressed in overalls and looks like work.” In other words, “easier” isn’t always “better”.